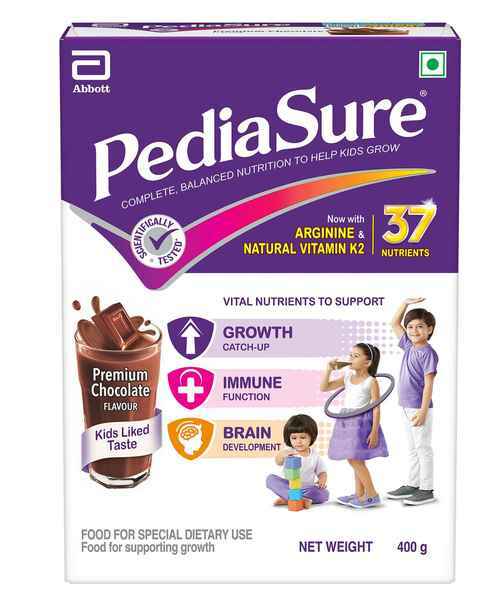 Designed for children above the age of 2, Pediasure Complete Chocolate BIB Powder is a complete balanced nutritional drink which contains 37 vital nutrients. The clinically proven nutrition ensures the best growth for kids through brain and body development, boosted growth of height and weight etc. It is a vegetarian product of 400gm net quantity which is well established in beyond 80 countries around the world. Gluten free and lactose free, the product strengthens natural immunity and boosts the overall growth process of the kid. The delicious and creamy chocolate taste is a bonus especially for fussy eaters. Research has proven that fussy eaters at nutritional risk on consuming Pediasure have experienced 45% lesser respiratory infection. The omega 3 and 6 taurina and choline in the product supports brain development at every stage of the growing child. Instead of nutritional drink, the flexible product can also be consumed as snacks between meals or supplementary meals.